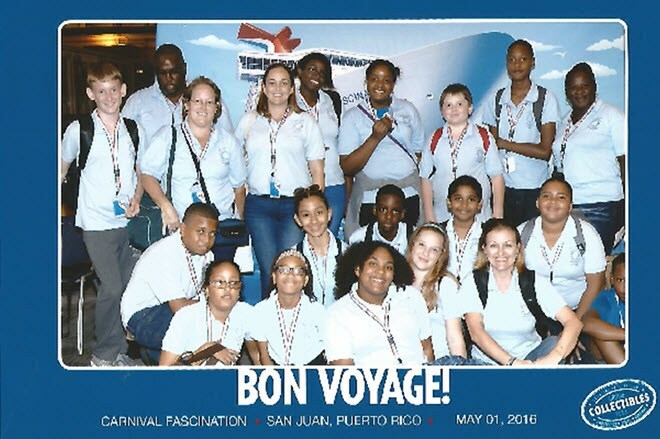 The Grade 6 class from Sacred Heart School recently returned from their class trip: a Carnival cruise out of Puerto Rico, with stops in St. Thomas, Barbados, St. Lucia and St. Kitts. Excursions during the trip included a visit to Harrison’s Cave in Barbados, where students went underground to gaze in awe at pools of crystal clear water, flowing streams, and crystallized stalagmite columns, a boat cruise to the UNESCO World Heritage site of the famous Pitons in St. Lucia, and a trip aboard the “Last Railway in the West Indies”, the St. Kitts Scenic Railway. The Grade 6 class, along with their parents and teacher, would like to thank The Saba Lions Club, Island Government, Saba Electric Co, Ms. Jennifer Zagers of Satel NV and TELEM SXM, SKOSaba, Mr. Claudio Buncamper of Winair, Paul Cizek of The Bottom Bean Café, the staff at the A.M. Edwards Medical Center, Saba Groove, and the countless businesses and individuals who helped make this trip a reality. We would also like to give special thanks to our chaperones Officer Wingrove Baker, Tr. Jarmila Wilson-Berkel, Mrs. Jolene Johnson and Ms. Maegan Hassell.